Click here to go to page 1 of Ontdek's walking tours page. 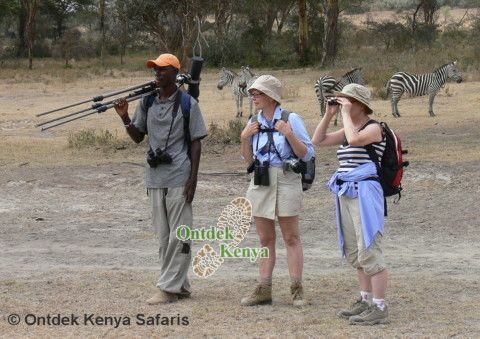 Join Ontdek Kenya walking tours away from mass tourism. Start with walks in the indigenous forests of the game rich Aberdare sanctuary and the Solio ranch. Do a safari in the Solio game reserve, which has the high population of black rhinos. Spend a night of wildlife viewing from one of the platforms at Treetops - a tree hotel in the Aberdares. 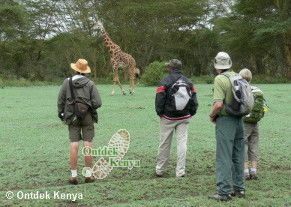 The tour then progresses to scenic places in the Great Rift Valley for more game viewing and walks in Crescent Island, Crater Lake, Hell's Gate and Elementaita with guaranteed interruptions from Giraffes, Waterbucks, Elands, Zebras and various Gazelles. The Solio ranch – which has a high concentration of Black Rhinos is a must visit in this area. Going to the tree hotel will add to the many highlights that you have already enjoyed in this guided walking trip. 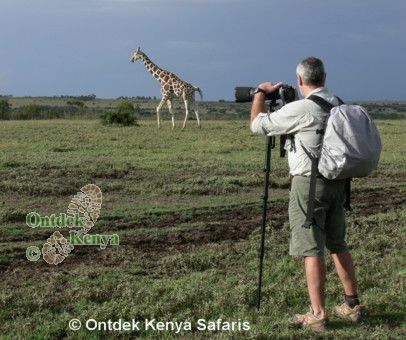 Should you be a bird watcher (see our birds pictures) or a wildlife photographer this walking holiday is ideal for you as there is time per location enabling you to indulge in your hobby. What's more with our competent naturalist guide who will accompany you throughout the tour, we guarantee you an all round nature safari. See detailed itinerary. Click here to go to page 1 of Ontdek's walking holidays.